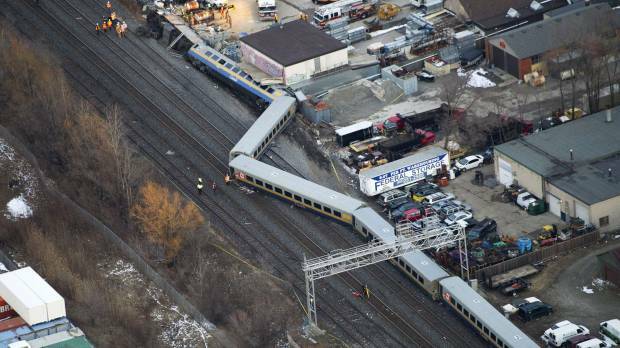 VIA train 92 derailed in southern Ontario at speed at about 3:30 PM today, and in the ensuing crash, three VIA Rail engineers lost their lives. I feel terrible for their families and friends. CBC is reporting that the train was carrying 75 people when it derailed. VIA 6444, the only engine, toppled over and appears to have extensive cab damage. It appears to me that there were five LRC cars and three of them went over on their sides, with the lead car striking a building. VIA Rail is reporting that three passengers were airlifted to hospital, and 42 passengers and a fourth VIA engineer were taken to local hospitals. The National Post has some large high resolution photos of the scene. Walter Pfefferle has a photo of VIA 6444 from February 15. I only saw it once, on November 17 2011 here in Winnipeg. My condolences to everyone affected by this tragedy. It's a somber reminder of the dangers that train crews face every day. EDIT: CBC reported that the three engineers who died were Ken Simmonds, age 56; Peter Snarr, age 52; and trainee Patrick Robinson, age 40. Mr. Simmonds and Mr. Snarr were based in Toronto and Mr. Robinson was from Cornwall. The first two engineers were long time VIA veterans, and Mr. Robinson was an experienced engineer but had only been with VIA since last October. Yeah, definitely very sad. My condolences to the family of the crew members killed and my prayers to the families of the injured!